Ole Years Night Small Plates Dinner – Menu items (small plates) include Steak Sliders, Korean Style Tartare, Maple Glazed Roast Turkey, Sorrel Lacquered Duck, King Crabs Tempura, Caprese Salad, Pumpkin Cappuccino Shots, Banana Beignets, Chocolate Espresso Truffles. Champagne Specials all night long. Link to full menu. Entertainment – Live Jazz & World Music with Caroline Mair. Time/Price – 9pm – 3am; $350/person VAT inclusive. Reservations are necessary, call (868) 628-9845. Link to general flyer. Ole Years Dinner at Buzo: Four Course Menu – Antipasti appetizer: Tagliere di Antipasti Misti (Prosciutto, salame, olives, cheeses); Fritto Misto (calamari & shrimp); Assortment of Bruschetta, Spicy melanzana; all served with a selection of homemade breads and focaccia. Primi Piatti first course (choice of): Gnocchi ai frutti di mare (shrimp, clams, mussels, calamari, sea bass w/fresh cherry tomatoes & basil pesto sauce); or Pappardelle ai funghi e tartufo (fresh mushrooms and black & white truffle pasta in a light béchamel sauce). Secondi entrée (choice of): Aragosta con Risotto Antico al Prosecco (lobster with Prosecco risotto); or Costolette d’Agnello alla brace con insalatadi grano e menta tiepida (rack of lamb with warm brown wheat and mint salad); or Filetto di manzo ai ferri con spadellata di funghi (petit filet with wild mushrooms); or Galletto Ruspante al fuoco vivo con Peperonata piccante (fire roasted Valle-Spluga free-range chicken Galletto with old fashion style slow cooked sweet peppers stew). Dolci dessert (trio of): Profiterol, Panna Cotta and Tiramisu. Menu is inclusive of a glass of Cascine 7 Prosecco & a glass of Limoncello di Capri. Time/Price: Two seatings: 6pm and 9:30pm; $550 plus taxes per person. New Years Eve Menu – Romance with Food: Starters –Lobster Ravioli in a Vodka Tomato Cream Sauce OR Mixed Greens, Mandarin & Feta salad. Palette Cleanser – Cranberry Grapefruit Sorbet. Mains: Red snapper stuffed with Lump Crab Meat topped with a Champagne Buerre Blanc with Basmati Pistachio Pilaf with Caponata Vegetables OR Marinated Duck Breast with a Cognac & Leek Reduction served with Risotto Cake accompanied with Caponata Vegetables OR Red Wine Marinated parsley coated Rack of Lamb, served with Butternut Squash casserole & chocolate jus with Caponata Vegetable. Dessert – Passion Fruit Savarin w/fresh fruit compote served with a sorrel balsamic reduction and a mango sorbet OR Pure ganache with layers of chocolate sponge finished with a chocolate mirror glaze OR Vanilla Bourbon Vanilla Bean Mousse topped with fresh berries. Link to flyer. Time/Price – Reservations start at 6pm; $500/single; $500/couple; $400/person (10 persons and over per person). Prices exclusive of service charge and VAT. Reservations at (868) 634-4000 ext. 424/434/439. Prices/Reservations – The Red Package – $1,900/person (inclusive of party, dinner, party favours); The Scarlet Package – $2,600/person (inclusive of party, dinner, overnight accommodation and breakfast); The Ruby Package – $3,900/couple (inclusive of party, dinner, overnight accommodation and breakfast). For reservations and more information call (868) 821-6443. Link to flyer. NOTE – Camp Hyatt for Old Year’s Night! Ring in the New Year at Hyatt Regency Trinidad and while you are partying, your kids can also have fun! Camp Hyatt is from 7pm to 2am and open for kids 4 – 14 years of age. For reservations and more information call (868) 821-6443. “New Year’s Eve Party Favors and Sparkling Wine for Toasting at midnight! Dress: Semi-Formal Contribution: $395 per guest. Please note that this is not a ticketed event and will be guest list only. Please RSVP with subject Old Year’s Night to kim@woodfordcafe.com.” Link to Post about event on Facebook. Crystal Ball New Year’s Eve Package ($2300/person): Waterbaby International Dinner* for Two – Poolside; Accommodation; Breakfast; Live Entertainment; *Dinner includes 4 complimentary beverages. Magic Wand New Year’s Eve Package ($1600/person): Waterbaby International Dinner* for Two – Poolside; Live Entertainment; *Dinner includes 4 complimentary beverages. Door prizes and bottles of bubbly to be won! Entertainment – Alternative Quartet and Shurwayne Winchester and his band Y.O.U. Please note that Top Hat Packages is NO LONGER AVAILABLE. Call (868) 621-5000 for reservations and tickets or email reservations@thecarltonsavannah.com. Link to flyer. “Dine & Celebrate “The New Year” in style @ The Hilton Trinidad with a Five Course Plated Dinner and a Complimentary glass of Champagne! New Year’s Eve Dinner includes Dancing Area, Welcome Drink, Party Favours and Wonderful Door Prizes to be won!” Link to Facebook event page. Time/Price – 7pm – 1am; $795/person – subject to 10% Service Charge and 15% VAT. Call (868) 624-3211 ext. 6200 or email: fb.trinidad@hilton.com for reservations. Old Year’s Night Dinner & Party!! Two Live Band! Sumptuous Buffet! Party Favours!! 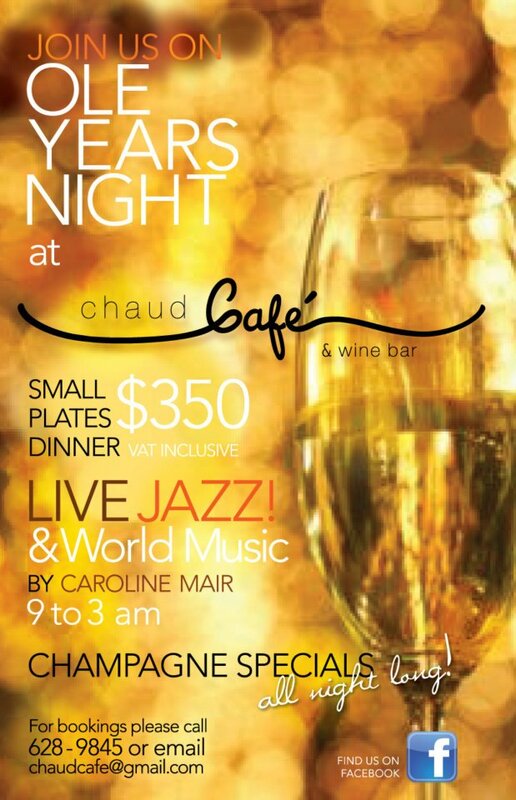 Call (868) 639-8442 for reservations. Gala New Year’s Eve Dinner – Dine on four courses of our chef’s finest and welcome 2012 on the Crown Terrace to the sounds of live band “Island Vibe.” Fireworks, Party Favours and of course lots and lots of bubbly all night long! Contact (868) 631-8151 for more information. Tags: New Years Eve Restaurant Trinidad, Old Year Trinidad Restaurant. Bookmark the permalink.